The atomic hydrogen gas of the Small Magellanic Cloud, revealed by the Australian Square Kilometer Array Pathfinder telescope, gives researchers a window into the dwarf galaxy's dynamics. A new radio image of our neighboring dwarf galaxy, the Small Magellanic Cloud, highlights its swirls of atomic hydrogen gas to help researchers understand the galaxy's evolution. 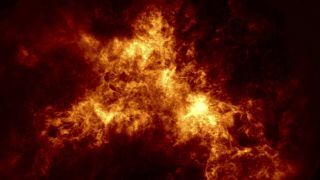 The new image, taken by the Australian Square Kilometer Array Pathfinder telescope, is the most detailed radio image ever taken of the dwarf galaxy, according to a statement from Australian National University (ANU). The Small Magellanic Cloud hosts millions of stars, is located about 200,000 light-years from Earth and can be spotted as a small smudge in the southern sky. The galaxy and its more massive sibling, the Large Magellanic Cloud, are satellite galaxies, which means they're gravitationally tied to the Milky Way. "The new image captured by CSIRO's Australian Square Kilometer Array Pathfinder telescope reveals more gas around the edges of the galaxy, indicating a very dynamic past for the Small Magellanic Cloud," Naomi McClure-Griffiths, co-lead on the new study and a researcher at ANU, said in the statement. "These features are more than three times smaller than we were able to see before and allow us to probe the detailed interaction of the small galaxy and its environment." While telescopes that collect infrared radiation like NASA's Spitzer Space Telescope and ESA's Herschel telescope have inspected the galaxy extensively, telescopes that detect radio waves have finally caught up with their level of detail, researchers said in the statement. But instead of the galaxy's stars and dust, the radio telescope can track the Small Magellanic Cloud's hydrogen gas, which is a major galactic building block. An optical image from the Hubble Space Telescope reveals part of the Small Magellanic Cloud. That gas can show more of the galaxy's extended structure, McClure-Griffiths said — and what she can see spells bad news for the Small Magellanic Cloud. "The outlook for this dwarf galaxy is not good, as it's likely to eventually be gobbled up by our Milky Way," McClure-Griffiths said. "Together, the Magellanic Clouds are characterized by their distorted structures, a bridge of material that connects them and an enormous stream of hydrogen gas that trails behind their orbit — a bit like a comet." The full Square Kilometer Array is slated to come online next year, according to the statement. The array will consist of telescopes spread across South Africa and Australia, as well as small antennas located across the globe.